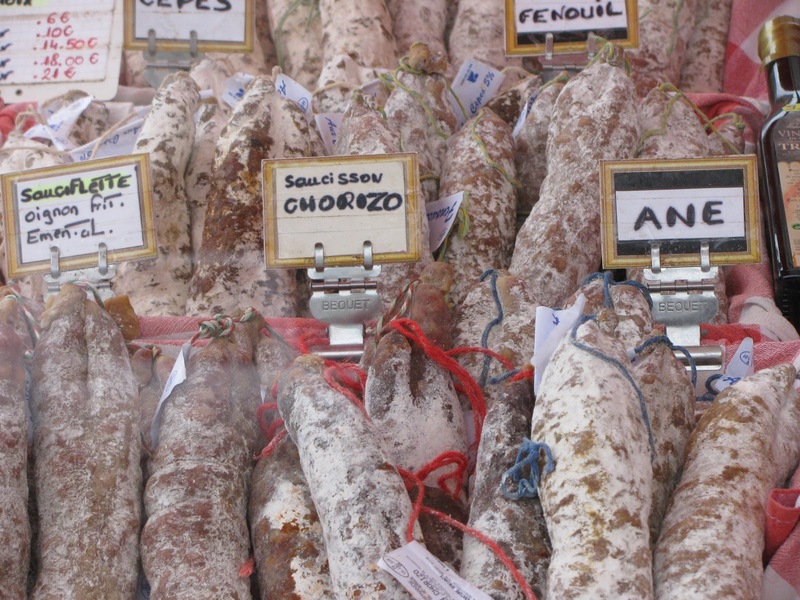 In yesterday's post, I mentioned that horsemeat and donkey meat are food products in France. I wasn't kidding. We stopped at the small Sunday morning market in Castelnau Montratier before going to our lunch with the donkeys.. There in the sausage vendor's display was donkey ('ane') sausage. I have no objection to eating either horse or donkey meat; I might even be persuaded to try it myself sometime. It was just a bit unsettling, though, to see it right before we had a date to dine with donkeys who had only just narrowly escaped this fate! Donkey meat is quite rare (but it makes sense as donkeys are quite rare), I don't think I've ever seen any not in a dried sausage form. Horse used to be pretty common when I was young (and it's delicious, probably my favorite red meat with ostrich), but it has become quite uncommon too. Partly because horses are becoming uncommon too, partly because of some lobbies I guess that get all emotional when horses are being eaten (but can't care less for cows, while personally, I don't see them as extremely different animals).